Home Food & Drink Why Does Swiss Cheese Have Holes? Why does Swiss cheese have holes? It has holes for the same reason soda is carbonated, bread rises, and beer is fizzy: carbon dioxide. The distinctive oval holes in Swiss cheese, about the size of a cherry, are called ‘eyes.’ They typically measure 1 to 3 centimeters across. The eyes are a byproduct of the unique bacteria used to make Swiss, which expel carbon dioxide during fermentation. Traditionally, Swiss is an Alpine-style hard cheese based on raw cow’s milk, originally grown in the rarified atmosphere of the European Alps. It is a cooked variety, since cooking preserves a favorable environment for the eye-producing microorganisms. In most other cheeses, gaseous bacteria are considered undesirable contaminants, but they give Swiss cheese its distinctive identity. ‘Swiss’ is North American slang for Emmental cheese, named for the fertile valleys by the River Emme in west-central Switzerland where it originated. The dairy farmers who live in this hamlet first perfected the art of hole-y cheese-making centuries ago. 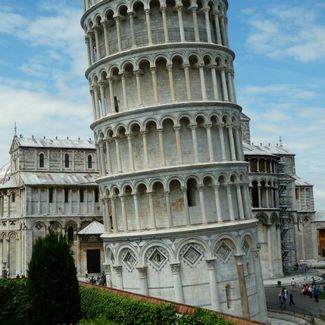 The same thing which gives Swiss cheese a slight nutty flavor also gives it its holes: propionic acid fermentation. Three types of bacteria are used, notably Propionibacterium of the subspecies shermani. In a hot environment, the rod-like microorganisms begin to ferment, consuming lactic acid to produce the chemical products lactate, propionic acid, and carbon dioxide (CO2). Fermentation then causes the CO2 to expand, creating air pockets of varying size. These pockets become the eyes for which Swiss cheese is famous. Fermentation can occur spontaneously or it can be induced by seeding with bacteria. Natural, spontaneous fermentation typically involves greater bacterial diversity and thus leads to irregular eyes without uniform size, as seen in varieties like Comté and Beaufort. To encourage regular eye formation, though, it’s necessary to use a specified starter culture in a controlled fermentative environment. This is typical in commercial production. The rate of carbon dioxide production is the principle factor behind the size and number of eyes you end up with. As a cheesemaker, you can control these outcomes in Swiss by modulating how much bacteria is added to the milk product, while controlling for other key factors such as pH. Cheese artisans monitor the fermentation process by listening to the resonance of the cheese wheel when it is tapped with a specialized instrument, called a trier. The idea is to give the bacteria long enough to ferment, but not too long. The proper formation of eyes in Emmenthaler, as it is known in the old country, depends on a combination of pressurized gas with balanced solubility and a healthy texture and rind. The texture must be nice and tight to capture the carbon dioxide gas. It is the mark of a good cheesemaker to be able to consistently cultivate wheels of Swiss with high quality eyes. 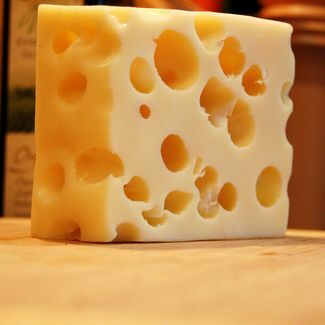 Swiss cheese that develops without eyes is called ‘blind.’ Today’s blind Swiss is considered defective, but years ago it was the presence of holes that indicated imperfection. Producers pressed them out during the aging process. Eventually, it was discovered that this labor was unnecessary, as the eyes caused no harm and gave the cheese a memorable look. With Swiss cheese, it’s a sure bet that the larger the eyes, the more potent the flavor. However, it’s more difficult to cut and mechanically slice large-eyed Swiss, so a balance is usually struck—at least for those who intend to sell their cheese in U.S. markets. Here, the size of the holes in commercial Swiss is subject to government regulation. Swiss eyes must be fairly small—between 3/8 and 13/16 of an inch in diameter. What Are the Best Apple Cider Vinegar Uses? Malt Liquor Vs. Beer: What Are the Main Differences? What is a Vegan? What are Sulfites and What Are Their Health Effects? Why Is Coffee Good for You? What Would Happen If All Oxygen on Earth Disappeared For 5 Seconds? Can You Learn How to Make Iced Coffee at Home Like a Pro? Did Early European Explorers Really Give Native Americans Smallpox-Infected Blankets?